Browsing articles from "May, 2013"
On the sunny California coast, known to be a playground for people and an important habitat zone for many marine species, researchers from the University of California Davis and rangers in the Año Nuevo State Reserve have successfully monitored and tracked a colony of 72 Elephant seals over a period of 2 months. The (p)H1N1 virus was found in 2 when the second swabs from 42, 2 of which were transient females, were taken on their return from over a month at sea and antibodies specific to combating the (p)H1N1 strain were found in all of them. While this strain appears to be seal specific, as in it has adapted itself to target seals, it is still the H1N1 influenza A virus that has been found in avian, swine and human populations because comparisons of the gene sequence were compared against known sequences from 6 sources (5 swine and 1 avian), the reason they know this (p)H1N1 strain is seal specific is because the sequences were cultured on human liver slices and found they did not survive, or more correctly did not have enough of itself to replicate and adapt. The importance of this to anyone handling marine mammals is obvious, personal protection is there to protect them from anything we may carry and to protect us from anything they may carry; this is clearly an opportunity for the H1N1 virus to become spread to humans if it is allowed to colonise and adapt so thorough cleaning of hands and equipment after treatment and release of the marine mammals is essential. CornSoUP is in Falmouth again, this time as Resurrection 5 and is being held at The Watersports Centre on Monday 20th May; this is a free entry event with the doors opening at 7pm and Dr Hiscock will take the stage at 7.30pm. Dr Hiscock Started diving in 1969 with the University of London BSAC club right here in Cornwall at Lamorna Cove, and his interest in the marine world started with shore and rock pool studies in his early teens. He has been diving around Britain over the past 44 years from the Southerly most tip of Cornwall to the Northerly most tip of Scotland and all points in between. On Lundy in 1969 he started a process that would establish the first Voluntary Marine Conservation Area (VMCA), and if you can think of a place that is next to the sea you will find his fin print on the way down to the water; just as he has left his mark on the marine biology world with his many survey papers and contributions to books. He is so well respected by marine taxonomists that he has a snail named after him, the Simnia hiscocki, even though he looks more like a seal in his kit when he walks back onto the shore. 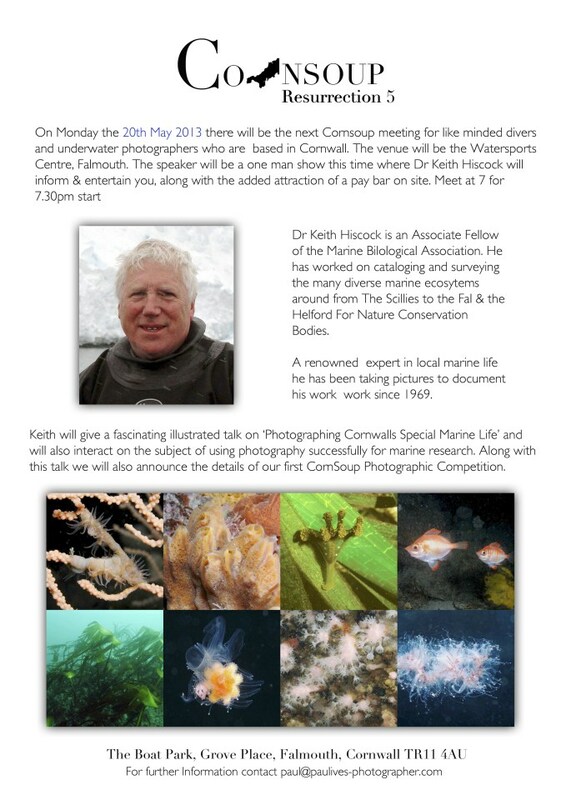 This is a unique opportunity to hear Dr Hiscock talk about marine life around Cornwall, especially seeing as he has probably identified most of it during his early work back in the 70’s and 80’s. Later, he led the Marine Nature Conservation Review of Great Britain (MNCR) team which collected much of the data for the Marine Recorder resource, and in 1998, established the Marine Life Information Network for Britain and Ireland (MarLIN) at the Marine Biological Association in Plymouth. In all this time he has taken thousands of photographs and has a wealth of experience with underwater photography, at Cornsoup he is going to be sharing that knowledge with all who attend. CornSoUP Resurrection has been re-introduced by Paul Ives, Charles Hood, Jane Morgan and Gaynor Bennet, and this will be the 5th successful offering where divers and students of the marine environment can be entertained by people who work in the field, and have traveled the world shooting video and photographs at a professional level. Paul has been lecturing the Marine and Natural History Photography BA at Falmouth University, since he moved to Cornwall 16 months ago; Charles is a local skipper and diver with the RHIB Logan out of Penzance; Jane is currently a student on the MN&H BA at Falmouth University; and Gaynor is a part-time lecturer at the University and staff PADI instructor teaching the lucky 1st and 2nd years on the course. Their goal is to bring together the local diving community and students to enrich the experience for both with entertaining talks from world renowned professionals in their field, and with four talks a year, they are growing in success. Previous talks have been on filming Arctic and Antarctic marine life by Jamie Watts at the first resurrection of CornSoUP in April 2012 and, in CornSoUP Resurrection 4 in April 2013, with award winning Jeff Goodman talking about filming techniques in different locations around the world with underwater photographer and journalist Jane Goodman in the second half talking about how to get work published. 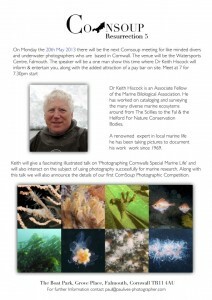 These events are free of charge, and while primarily for the students on Paul’s BA course, are open to the general public as well, giving anyone that has an interest in the marine environment and photography or videography above and below the water an opportunity to tap into the wealth of knowledge being shared by professional photographers, videographers and journalists; these should not be missed by anyone and the future Cornsoup talks will have more exciting topics and speakers. As always I was running a little late and managed to park in the free car park at St Agnes without running over anyone’s kit, it was great to finally meet some more of the Seasearch divers and they all seemed like a fun bunch. The dive briefing held by Angie at the shoreline was brief but well explained and we were guided to where our surface swim would take us to drop on the old harbour wall. The other groups had already gone when Andy (my buddy) and I got our briefing and into the water, we had already discussed that at 100 bar we would be turning around to come back to the wall to surface, and so started our surface swim and I was really excited with the number of things I was about to see. It was a beautiful evening slowly swimming out to the point, the sky was clear and the sea was as flat as a pancake, building the anticipation as we neared the end of our 6-8 min swim. I had to laugh because I was keeping an eye on Andy yet when I looked over my shoulder to see the point, I kept drifting toward him and had to adjust my direction but we reached the drop in, looked at each other, signaled and slowly started to descend. I wish I had taken my camera, but had been advised on my first 2 Seasearch dives not to as there was a lot of information to write down and sketching the map would get hectic, I was glad I had taken the advice on-board as it was hectic; as soon as we dropped onto the top of the old wall I could see I was in for an interesting dive where I was going to learn a lot. The Kelp Forest ontop of the wall was a little misleading, it looked barren underneath, but looking toward the bottom of the wall where the Kelp was sprawled as far as the eye could see there were so many things all over the rocks, it was like my fist time into an underwater paradise. All this was hidden beneath the waves at St Agnes where most people that visited the beach would never even know it was there. Andy was pointing things out to me as we swam along the wall; from the 5 species of Sponge, the Double Spiral Worm colonies crammed into the nooks in the wall, an Edible crab the width of my shoulders, which waved at me to warn me to stay away with a claw the size of my hand, and I was taking the time to look at the inhabitants of this small area of the dive and it was fascinating. We carried on further along the wall, Andy was snapping away with his camera and it opened up past the Kelp bed to an area of gravelly sand with many species of Seaweed, empty Shells and plenty of Common Spiny Starfish which all looked like they had a weight issue from the plentiful food around them. I also spotted something bright green from a distance attached to a piece of seaweed on a lone rock in the sand, Andy took a photo of it for me and we later found it is was the eggs to a Green Leaf Worm which are found more abundantly on the South Coast. We generally swam in a North-Westerly direction from our descent and after a good 25 minutes we changed to a South-Westerly direction heading back toward the bottom of the cliffs over the Kelp Forest. I was gently moving the Kelp to the side so I could see what was beneath and the number of Spider Crabs was amazing, I later found out they breed in a cave near by and would have most probably been making their way to it as the tide was coming in, I was seeing the different sponges, Bryozoan and more and was glad of the in-depth day spent learning about species identification and classification at the Headquarters of Seasearch Cornwall a few weeks before. The closer we got to the cliffs, the shallower it got and we found ourselves coming up from 9m to 5m and as the tide was on the way in the surge was starting to build. We made our way back along the South-Easterly heading toward the old harbour wall and while Andy kept snapping away I was trying to draw the cross section of the dive we had done so far. It was too tempting to put the slate away and keep looking for things under the Kelp, especially as I was starting to see the mixed species that were growing off it. It was one of the best 50 minute dives I have done to date, there were a few Pollock and Wrasse along the way but it was the smaller stuff, that to most would look more like many species of plant that fascinated me. We got back to the wall and started to surface from about 4m and as we made our way with the surface swim back to the beach I couldn’t stop smiling. Andy had been an awesome buddy to dive with, yes he had his head stuck in all the nooks and crannies to photograph things but he always kept looking around to check I was OK.
At the beach we were asked our air out, and our greatest depth, which we were then told we won as we had the deepest dive but it appeared there wasn’t a prize, not even a doughnut. Cat was really interested in hearing how the dive went as we walked back to the carpark and was starting to fill my head of names of things I was trying to describe but it was all a bit of a blur. After we had a tea, and sorted our kit out we headed to the Driftwood Spars, a really nice little pub with a large back room that we were able to huddle around the tables to check the books for the species we had seen and to fill out the Seasearch forms. I will return to St Agnes with a couple of friends to dive the area again and will take my camera along, and my friend will bring his GoPro so it will be a more exciting read with some photos to show off what makes St Agnes VMCA (Voluntary Marine Conservation Area) such an important site for the North Coast of Cornwall.